3M's Micropore Surgical Tape is a latex-free, hypoallergenic paper tape that is ideal for frequent dressing changes. Once the Micropore Surgical Tape is removed, minimal adhesion is left behind, which reduces the potential for irritation. This surgical tape is porous for breath ability and improved healing. 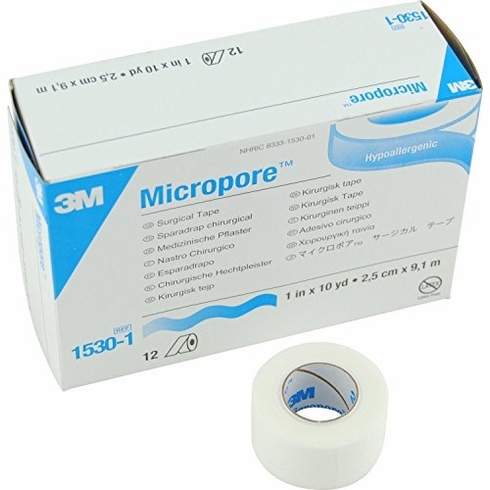 Micropore Surgical Tape is available in white or tan. Micropore tape is useful in both hospital and home settings. As a surgical tape it is useful for securing wound bandages that require frequent changing. For home use, Micropore medical tape is a medical paper tape that is hypoallergenic; thereby, accommodating sensitive individuals. It serves well as a home wound care bandage. 3M Micropore Tape offer physicians, caregivers and patients several advantages. This medical tape is lightweight and breathable to promote healing. It serves as an excellent adhesive for bandaging wounds and fixing wound dressings. The adhesive leaves little or no residue, making frequent bandage changing easier and more comfortable for the patient. Micropore is a hypoallergenic tape.